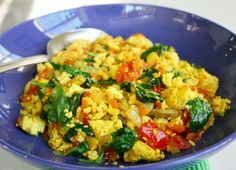 A restaurant recipe for a Spinach Scramble called a "Popeye" Breakfast Scramble? Okay ...The restaurant guests and I like life to be a little fun. In fact, most of us would like life to be a lot more fun...we need to laugh almost as much as we need to eat. And if you serve this omelet with fruit or a couple slices of tomato, you will also have a great low carb breakfast to enjoy. Preparation time: 12 minutes. Servings: 1-2. 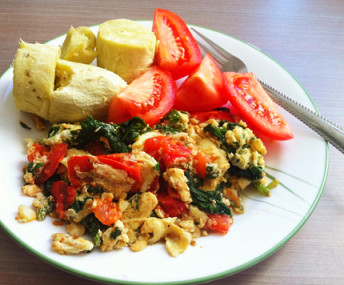 Enjoy your restaurant recipe that is called a Popeye Scramble and the company of those you share it with! Did you know? Spinach is thought to have originated in ancient Persia (Iran). Spinach made its way to China in the 7th century when the king of Nepal sent it as a gift to China. Spinach has a much more recent history in Europe than many other vegetables. It was only brought to that continent in the 11th century, when the Moors introduced it into Spain. In fact, for a while, spinach was known as "the Spanish vegetable" in England.